After finally trying the Cairngorms a couple of weeks ago, and discovering that they're much much more than the Big Boring Lumps I'd imagined them to be, my scanning of the weather runes started to encompass the East of Scotland, this now being an option given that the weather there often seems to be radically different to that in the West. And whilst the weekend forecast for the West was poor, that for the East seemed to be shaping up; so with the encouragement of the CEO, I decided to go for Saturday or Sunday, depending which looked the most favourable a couple of days in advance. By Thursday, Saturday looked the favourite - MWIS was a bit equivocal (cloud risk above 900m); the Norwegian Met Office very positive - so that was that. The only downside was that I would have to travel on Friday afternoon, which is always a tremendous pain! But I forgot about the past pretty soon. Approaching midnight, as I drove up the A93 to Braemar, there was a bright full moon and a crystal clear sky. BIG adrenaline shot! I dressed in full midgy gear to pitch my tent at the Linn of Dee; but although I didn't risk taking it off, it didn't seem as if there were any about - a big contrast to a week ago! Once the tent was up, I got out the maps to work out a route by torchlight. 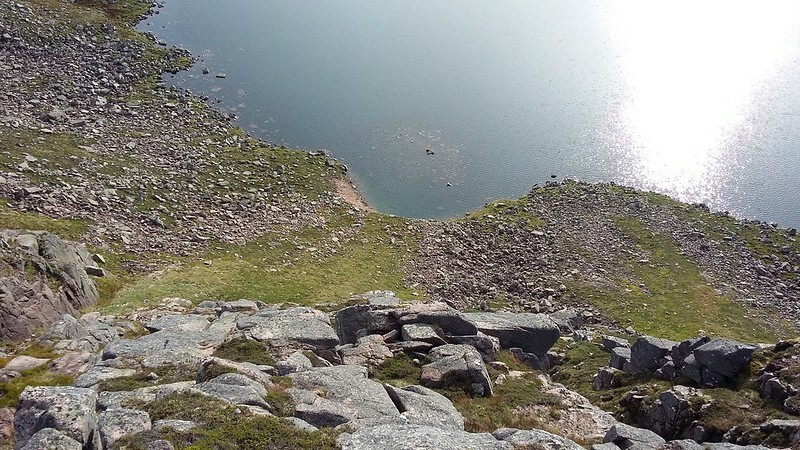 My main interest was to walk around the cliffs above Loch Etchachan - it looked like such an amazing place: a decent sized lochan at 930m elevation!! 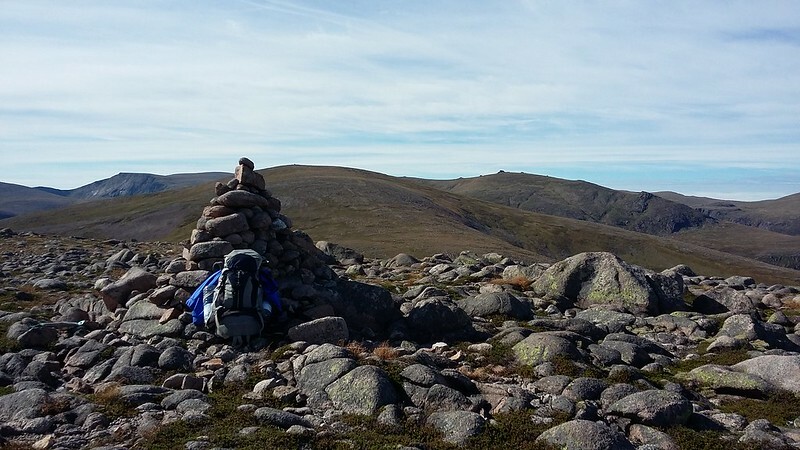 In the end I plumped for a circuit including Derry Cairngorm, Carn Etchachan, and then along to Beinn a' Bhuird, returning to Derry Lodge via Beinn Bhreac. I'd originally sort of hoped to include Ben Avon, but it looked like there wouldn't be enough daylight. The only decision to be made tomorrow was whether to go clockwise or anti-clockwise. 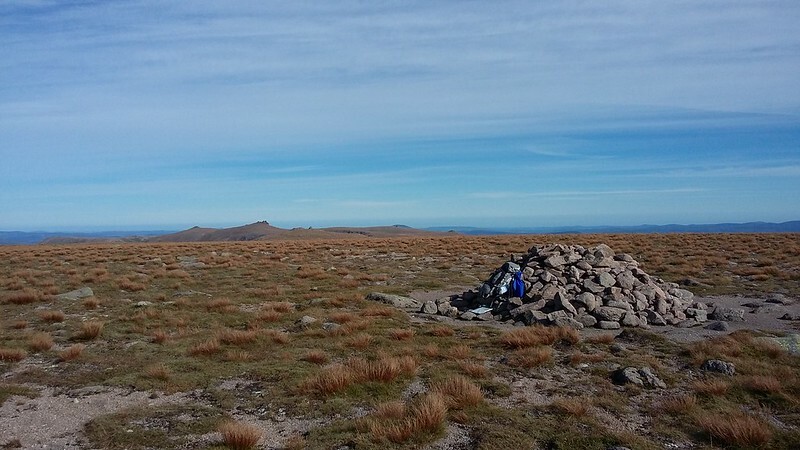 I wanted to be on top of DC in fine weather, and examining the map I more or less convinced myself that if the cloud was down I would be able to navigate from Beinn Bhreac to Beinn a'Bhuird with map and compass (I think this was wholly misguided - more on that later!). But with only that to decide on, and the route sorted in my mind, I covered myself with my bag (too warm to get into) and dropped off, listening to the squawks of the owls, and praying for good weather on the morrow!! And indeed it turns out to be perfect . Firstly: cold, crisp and no midgies! And although it is still "dark" when I leave the Linn of Dee at about 05.30, the moon is so bright that it casts strong shadows, and no torch is necessary on my bike. But gloves are - it's really quite chilly. In the bright moonlight, the path up Glen Lui is easy to follow; and even when I cut off right up the hill towards Carn Crom, it's light enough to see the going underfoot quite easily. It's rather rough and heathery, but in fact pretty straightforward. 2016-09-17 06.14.45. There's a slight ground mist around the river, and the Eastern sky begins to lighten. Views at 06.37. Varying light conditions in the early morning light. 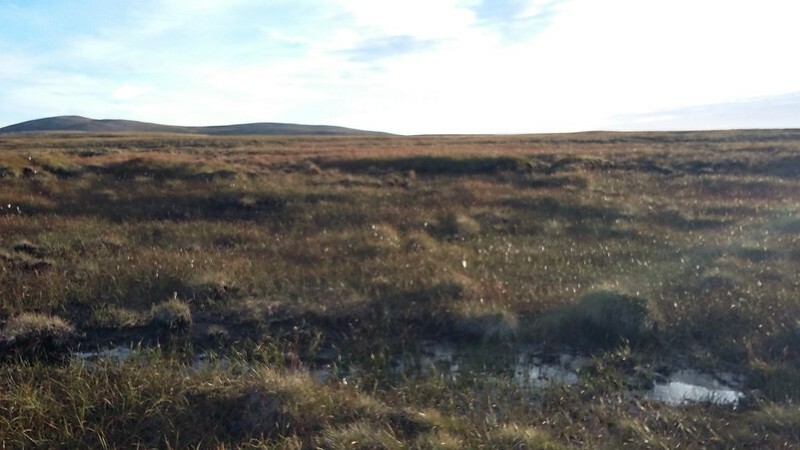 The scar ahead is where I'm aiming, en route to Carn Crom. The ground conditions can be seen in the foreground of the pictures. 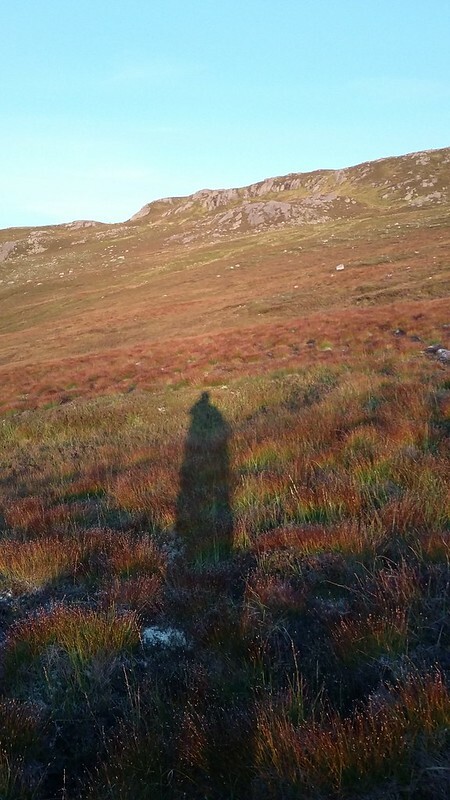 The views in all directions are fantastic as the rising sun illuminates the hills in a rapidly changing kaleidoscope of colours.... this is just such an uplifting time of day: there's nothing better that being out in the hills at sunrise on a fine morning. And the only accompanying sound is the agitated chatter of grouse as I ascend. 2016-09-17 07.15.20. 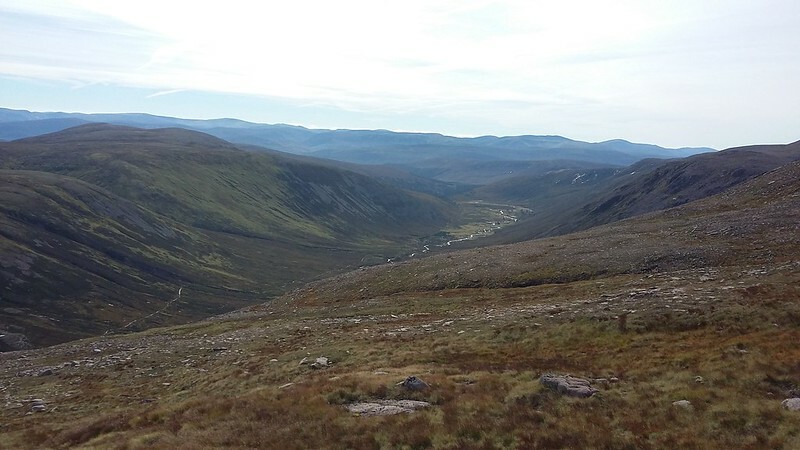 ...and this looking back along Glen Dee. This is clearly going to be a 200+ photos day ( it turns out to be nearer 250)!! 2016-09-17 07.20.03. 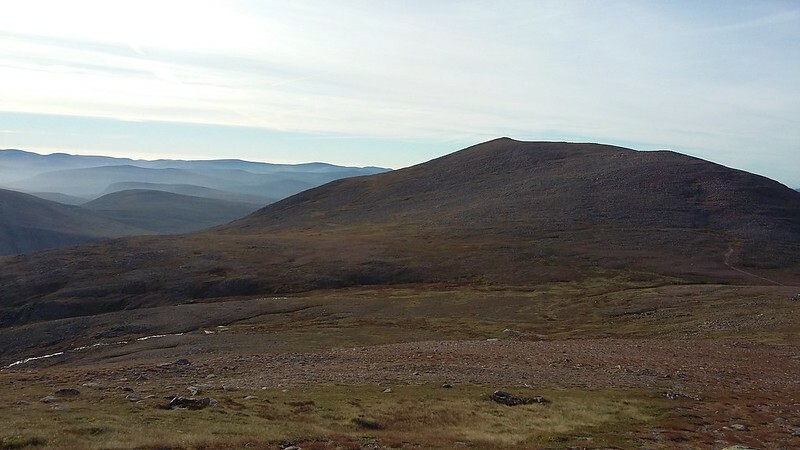 Panorama from Carn Crom looking generally West towards Carn a' Mhaim in the middle foreground, and Braeriach in the background. Now the chatter of grouse has given way to the strange grunting of Ptarmigan. 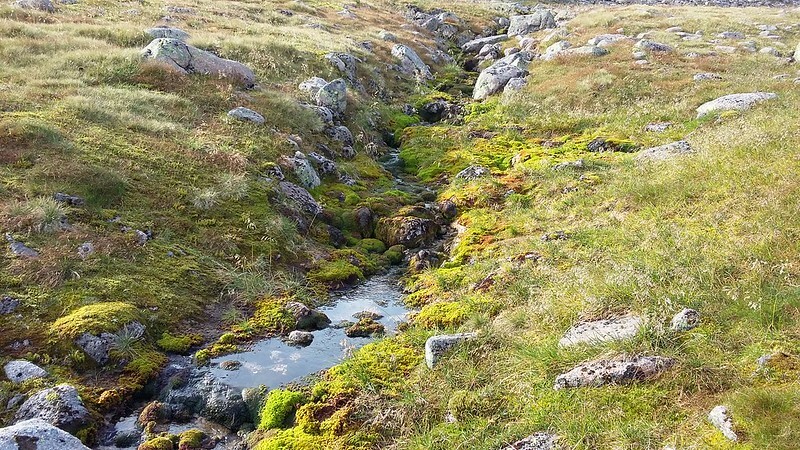 Wonderful: the sounds of the Highlands. 2016-09-17 07.25.16. 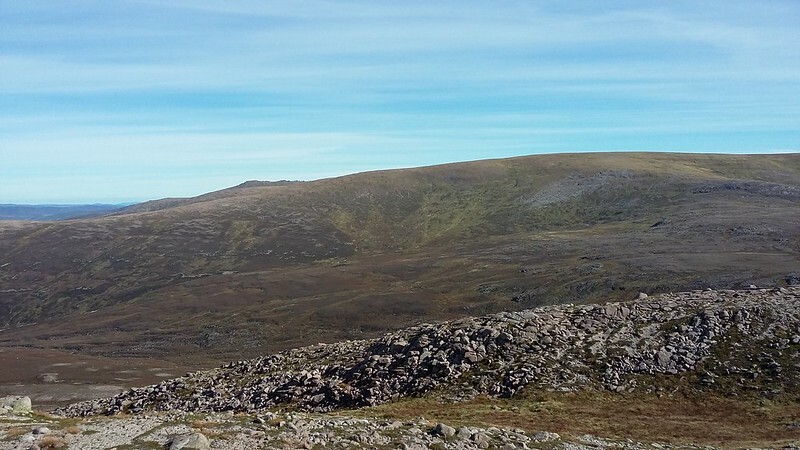 Looking ahead (more or less North) toward Carn Crom (with the Cairn), Derry Cairngorm in the centre, and Ben Macdui to the left. Beautiful or what...??? 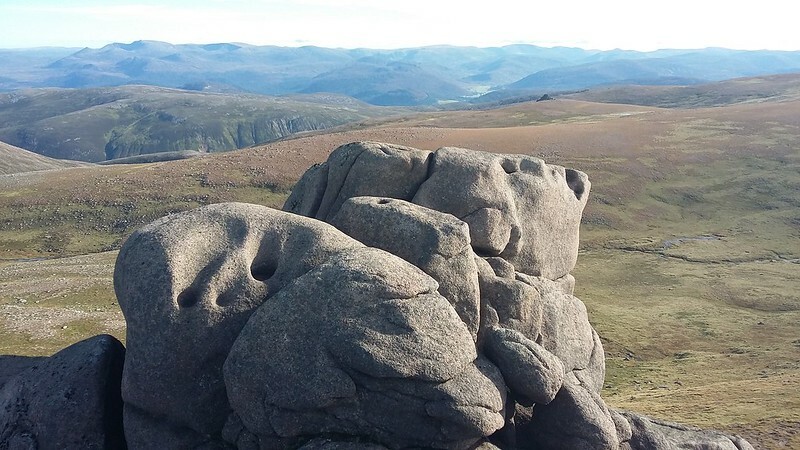 An easy walk from Carn Crom to Derry Cairngorm. 2016-09-17 08.13.56. 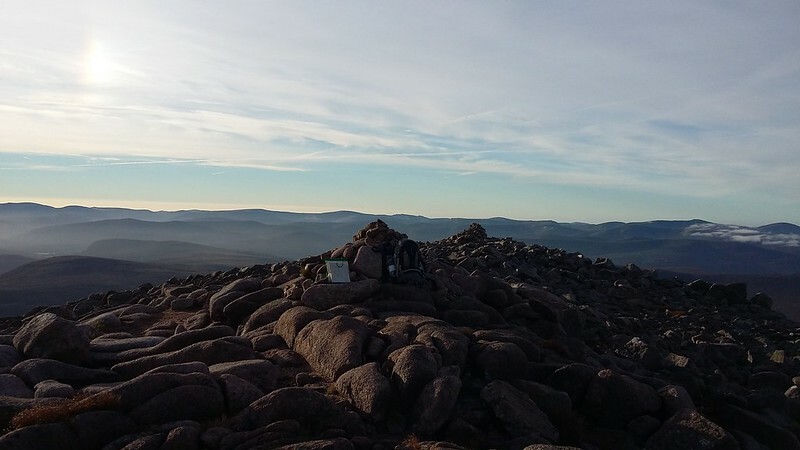 Derry Cairngorm summit, with trusty sac. A bit over 2 hours walking - feels like time for breakfast, so I contemplate the views for some while as I chew on a bagel. 2016-09-17 08.12.09. 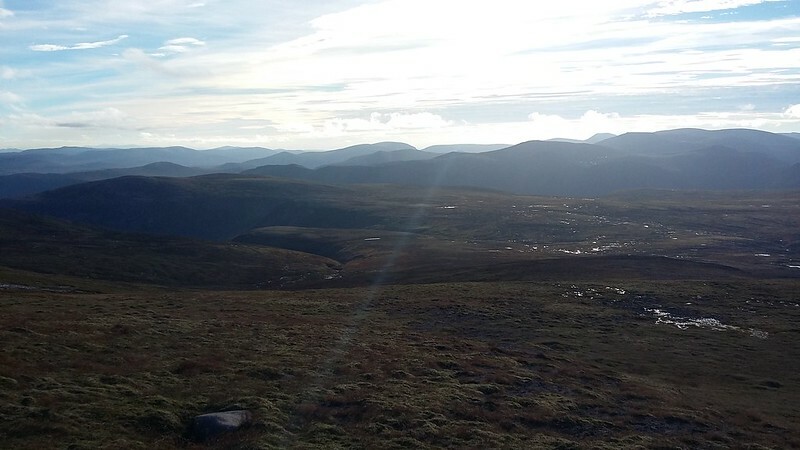 Looking from the summit of Derry Cairngorm towards Ben Macdui, with Loch Uaine peeping out below. 2016-09-17 08.35.48. 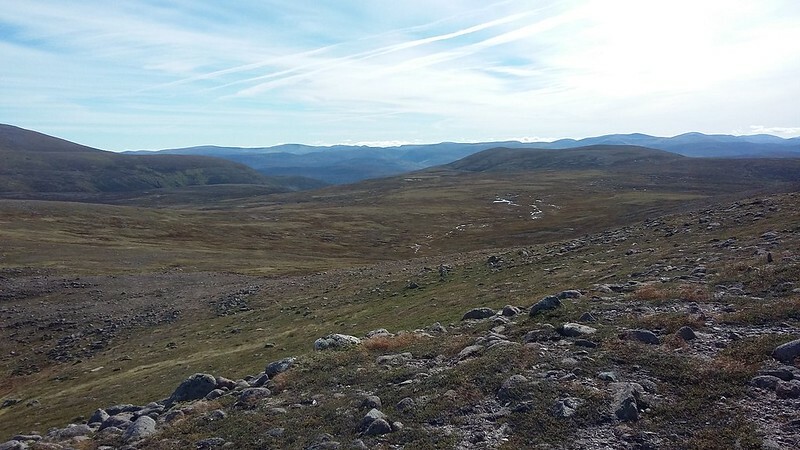 The route running South across a typical Cairngorm boulder field towards Creagan a' Choire Etchachan. Towards the bottom of the boulder field I meet the first fellow walker of the day, complete with black labrador. 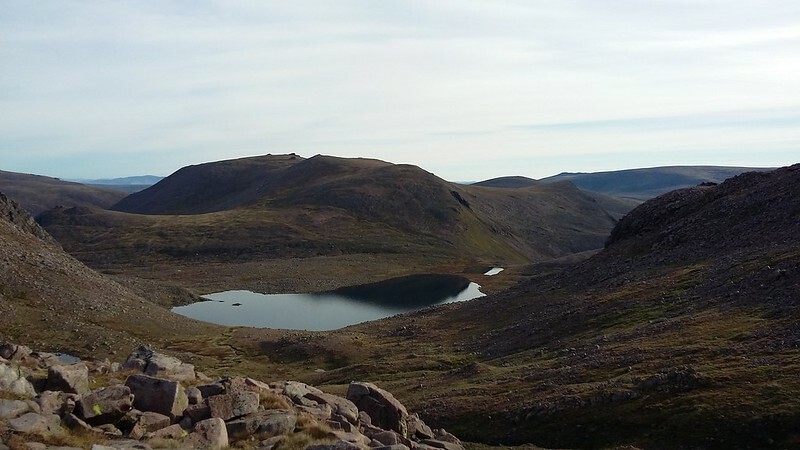 He's camped overnight at Loch Etchachan, and he confirms that it's a pretty fine place. We chat briefly and then go our opposite ways. 2016-09-17 08.56.53. 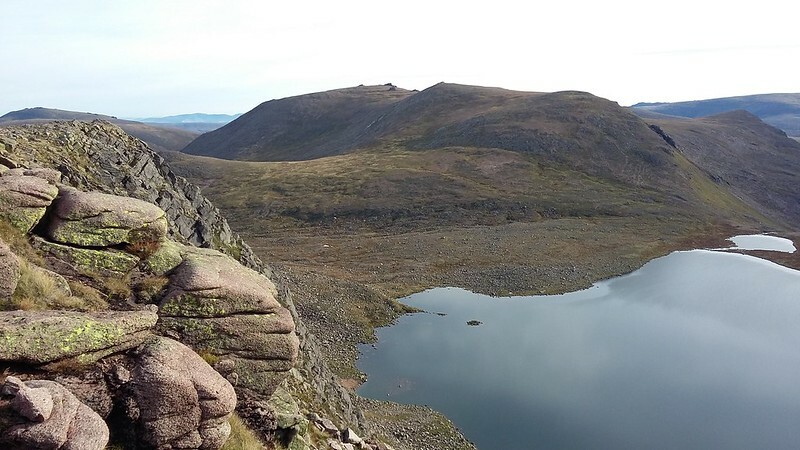 Summit of Creagan a' Choire Etchachan, with the beautiful loch to the left, Beinn Mheadhoin in the background right, and (I think) Cairn Gorm in the background. 2016-09-17 08.54.00. 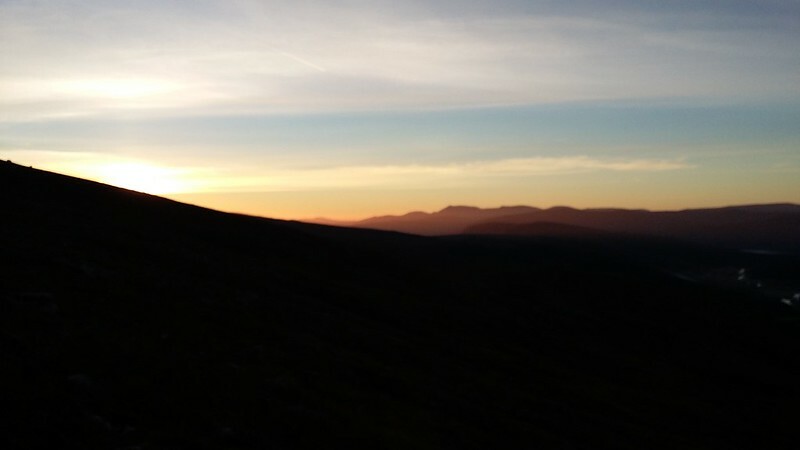 Looking back towards Derry Cairngorm - ethereal purple mountains behind. 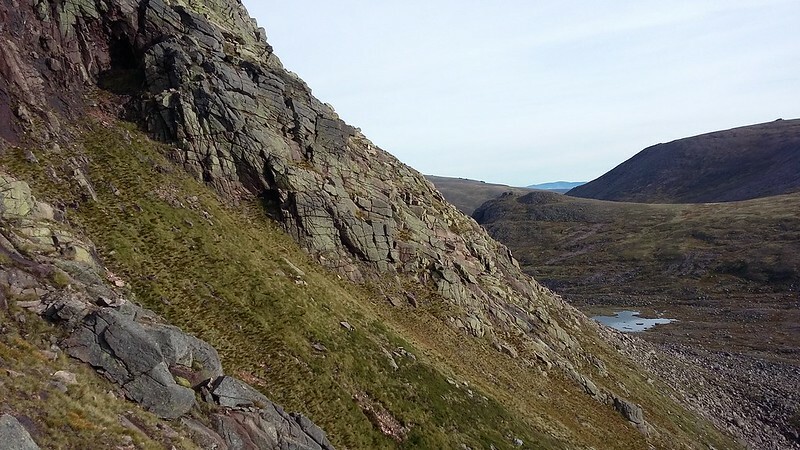 The next stage is a walk around the top of the cliffs surrounding Loch Etchachan. 2016-09-17 09.31.53. Looking across Loch Etchachan towards Beinn Mheadhoin, the next goal. 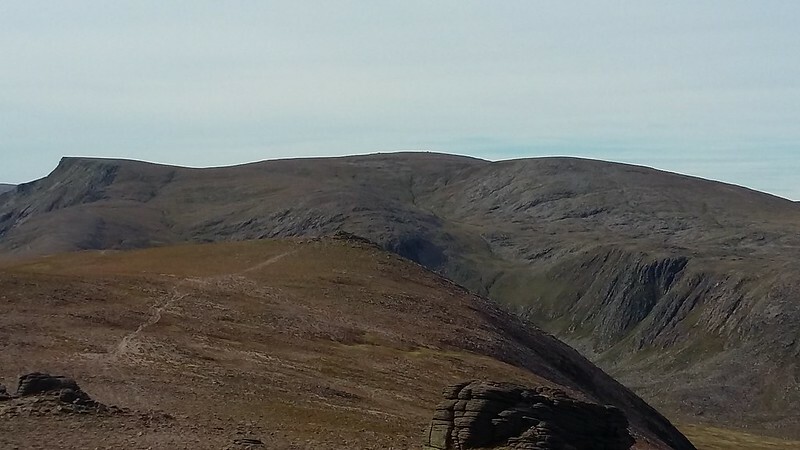 The walk around the cliff edge is without difficulty, and I imagine that route finding in clag would also be reasonably straightforward, because of the dramatic topography. In fact route finding all the way so far would be OK in clag, I think. 2016-09-17 09.45.12. 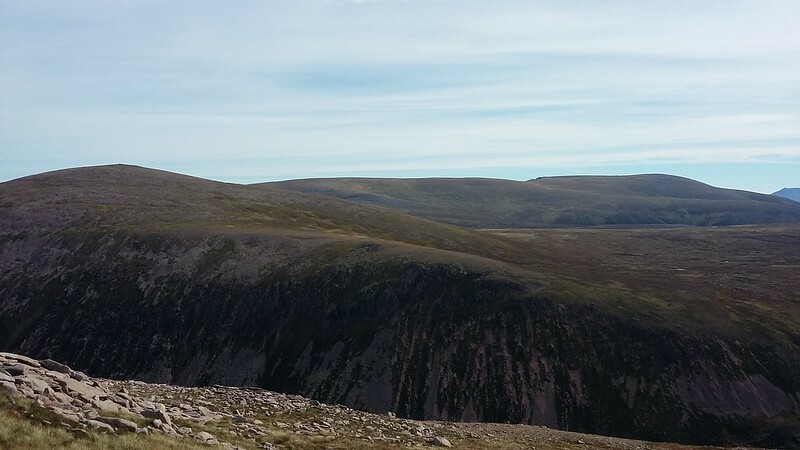 Looking back from the cliff top towards Creagan a' Choire Etchachan (left) and Derry Cairngorm (right). My original plan had been to walk around the cliffs, savouring the views of Loch Etchachan, and then to descend via a grassed gap. However, having summited Carn Etchachan, I can't resist going back to the cliffs to take in the views across Loch Etchachan for a bit longer. 2016-09-17 09.53.4. And then I notice that the cliffs looked scramble-able. After a slight hesitation, optimism overcomes discretion without too much difficulty, and I set off down. 2016-09-17 09.53.50. This is fairly typical, and it doesn't look that dramatic from here; but there are quite a few short cruxes that I end up chickening out of (my excuse is that I have a torn shoulder ligament that will be operated on shortly, so I can't afford to make it any worse... ). The result is that the descent takes over three quarters of an hour, rather than the 10 minutes it would have taken had I followed the original route I'd planned. It is very exhilarating, but it means that later I have to abandon plans for one of the tops. 2016-09-17 10.27.44. Loch Etchachan is really a magical place. The guy I met earlier who camped there had the right idea: this truly is a place you need to savour at leisure. 2016-09-17 10.35.04. On the ascent to Beinn Mheadhoin, a panorama looking back at the magical loch. 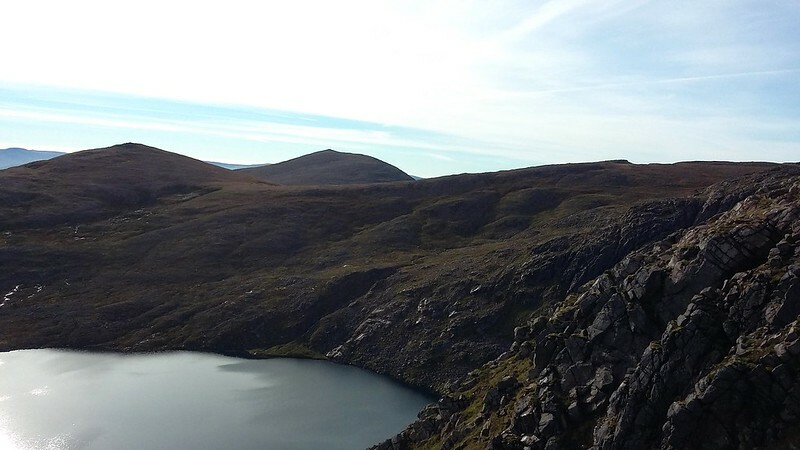 Once on the ascent, I notice that there are a few tents scattered about: Loch Etchachan is clearly a reasonably- rather than a well-kept secret! 2016-09-17 10.40.56. Plenty of clear paths, not shown on the maps; and a dramatic view of slabs around the Forked Gulley on the left. Scramble-able, I wonder??? 2016-09-17 10.53.10. 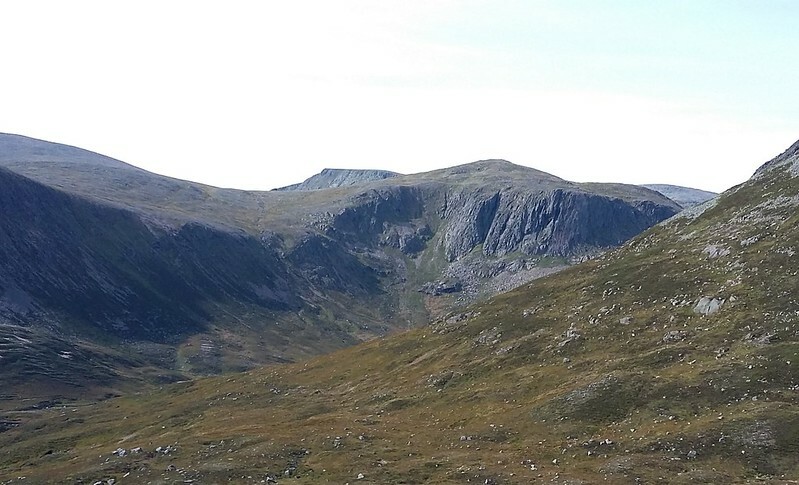 On the way up to Beinn Meadhoin: another view looking South and featuring Forked Gully on the right. I feel I should pinch myself, the weather is so brilliant. [2016-09-17 11.05.52. 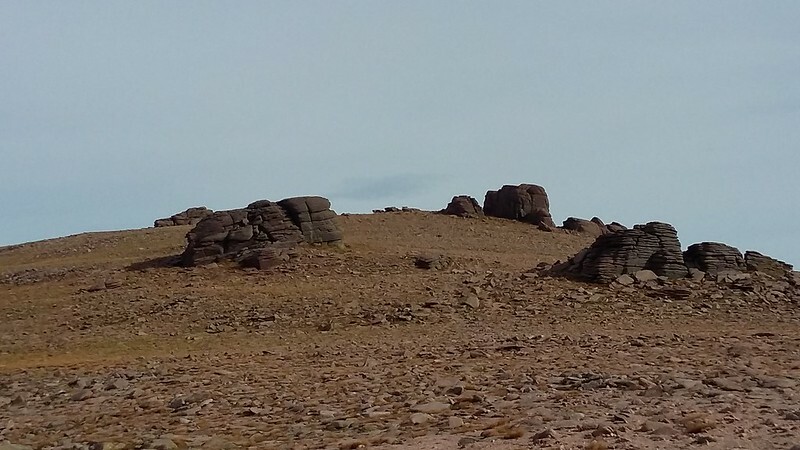 Scene from "The Martian" - aka the Barns of Beinn Mheadhoin. Wild stuff! 2016-09-17 11.14.30. Looking West from the summit of Beinn Mheadhoin back towards Ben Macdui. 2016-09-17 11.14.54. And the full panorama... Wonderful. I sit for a while imbibing the splendour of the views while consuming a cinamon and raisin bagel. Perfection! 2016-09-17 11.40.47. View looking down Glen Derry on the descent from Beinn Mheadhoin into the head of the glen. 2016-09-17 11.40.54. 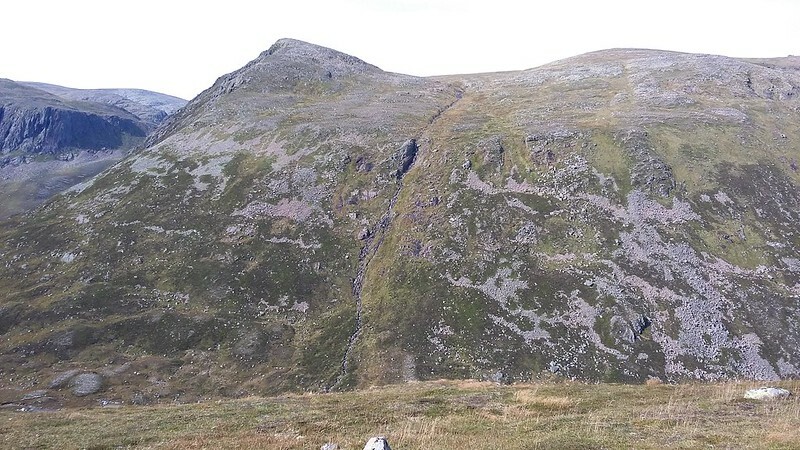 On the left, the next goal: Beinn a' Chaorainn. Nearly 450m descent and 350m ascent. 2016-09-17 12.12.25. Looking back West, Forked Gully looks amazing from here - a real climbers' playground. 2016-09-17 12.13.12. Looking back at the descent from Beinn Mheadhoinn. I came down to the right, which posed quite a risk to the ankles due to the boulder field being overgrown with heather. 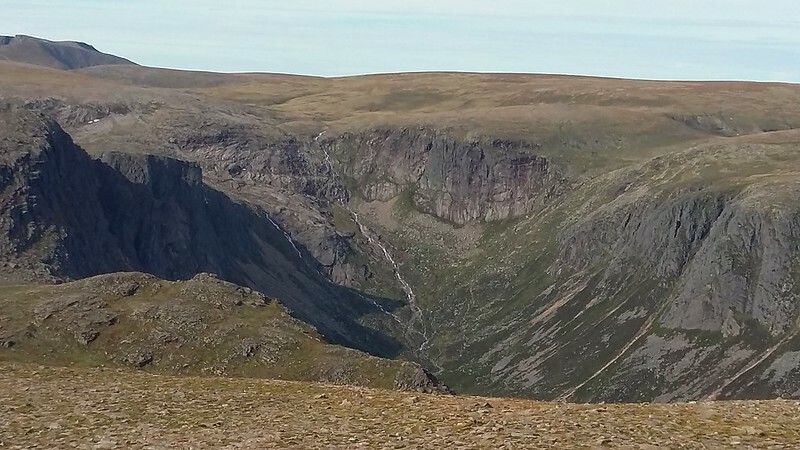 I think a safer route would probably be to descent on the North side of the burn (more or less centre of the pic), where there seem to be far fewer boulders. 2016-09-17 13.01.15. It's a bit of a slog up the first steep ascent from the glen head, but after that it's a gentle slope to Beinn a' Chaorainn. Where I meet a couple from Edinburgh, who kindly take this pic - "looking back to where I've come from" - sounds positively philosophical! 2016-09-17 13.17.48. 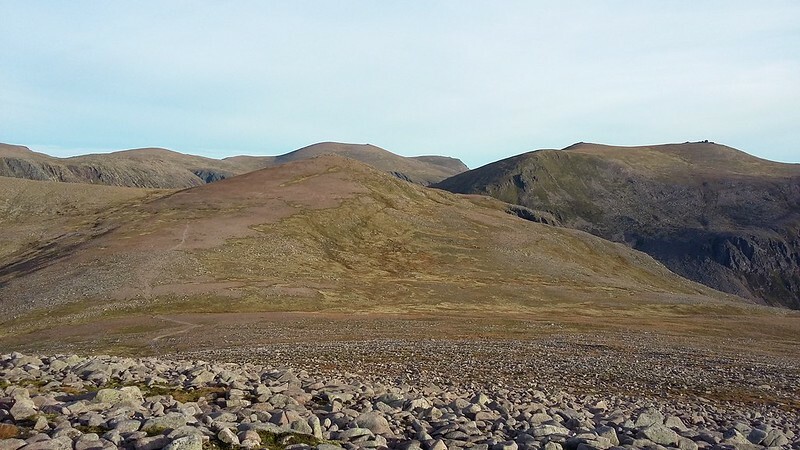 ...then across to Beinn a' Chaorainn Bheag - again easy going, as can be seen from this pic. 2016-09-17 13.30.38. The view back towards Beinn Chaorainn from Beinn a' Chaorainn Bheag. 2016-09-17 13.32.52. Heading towards Beinn a' Bhuird. It doesn't look so far away, but in fact it's about 5 km - albeit the walking remains easy. 2016-09-17 14.28.45. 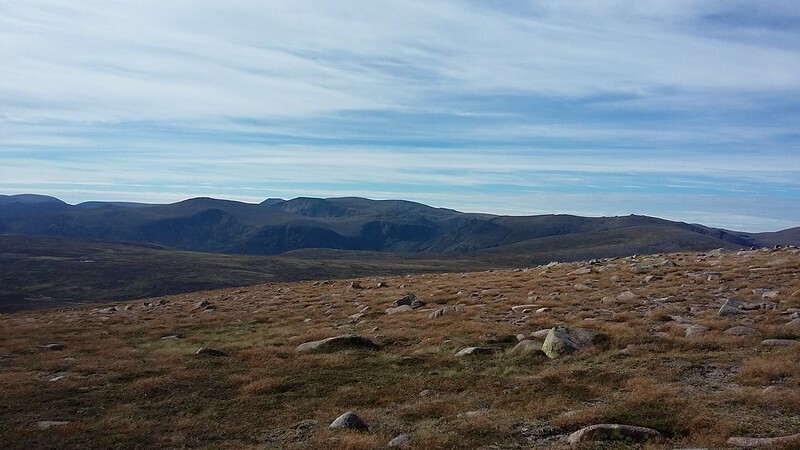 Looking back along the route I've come so far: Beinn Mheadoin on the right, Derry Cairngorm on the left. 2016-09-17 14.33.21. Same panorama from further up the hill. Phenomenal!! 2016-09-17 14.51.56. Then, at last, I'm there. Ben Avon looks inviting in the distance, and really not too far. I sit down for a bit of lunch, when all of a sudden a couple of blokes appear, apparently out of nowhere. One only stops very briefly before heading off in the direction of Ben Avon, while the other stops and sits down, and we chat for a while. 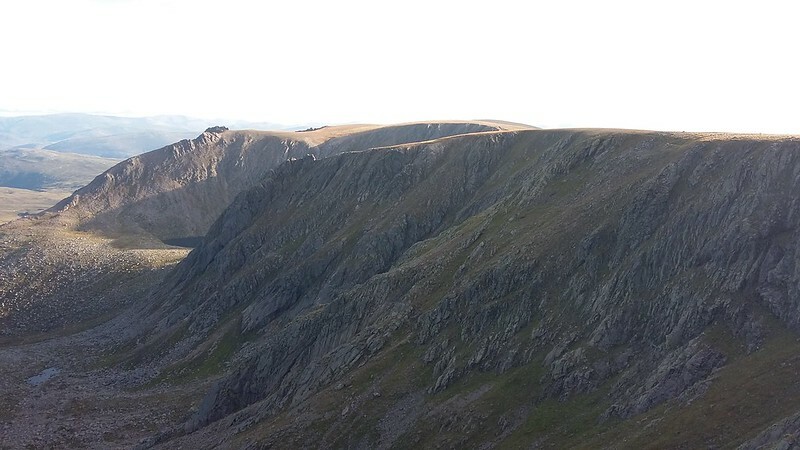 He asks about my route, and when I say I'm now heading to Beinn Bhreag, he asks if I don't feel like grabbing Ben Avon whilst I'm there: in his view it's one of the best mountains in the Highlands, along with Aonach Eagach, An Teallach, etc. I look at my watch and at the distances on the map. It will take at least 2 hours to get there and back, and I'll be struggling to get back in daylight. I look across again at Ben Avon - it certainly does look appealing. Decision made! 2016-09-17 15.36.57. 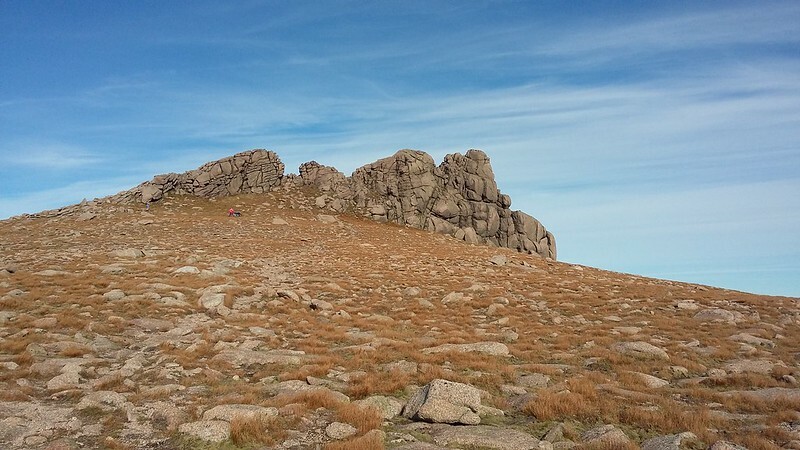 I set off as fast as my by now rather tired legs will carry me, only remembering when I get well down the Sneck that I don't need to lug my sac with me. So I stow it next to an easily identifiable large rock, and continue, lighter and quicker. This is a view of the Sneck looking towards Ben Avon. 2016-09-17 15.54.05. And before too long I'm approaching the summit. It's taken just about an hour. This pic is looking back down to the Sneck the way I've come. 2016-09-17 16.11.56. The summit - rather dramatic! 2016-09-17 16.12.36. 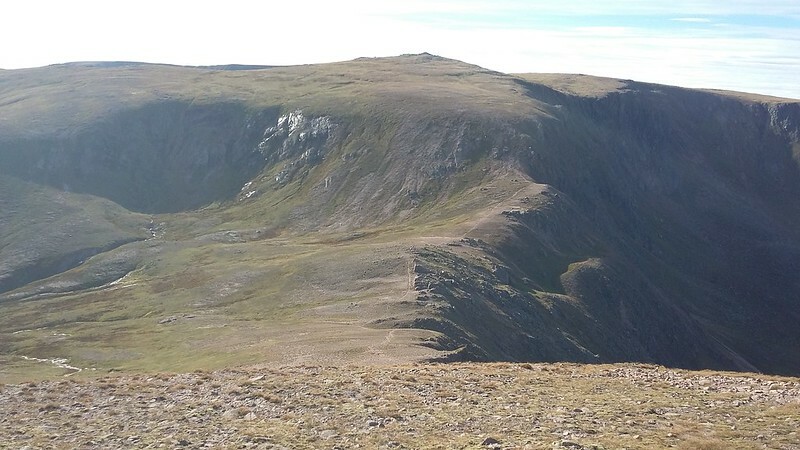 Panorama looking more or less due East, Garbh Coire in the middle, the Sneck to the very left. 2016-09-17 17.13.14. Then hastily back to Beinn a' Bhuird. 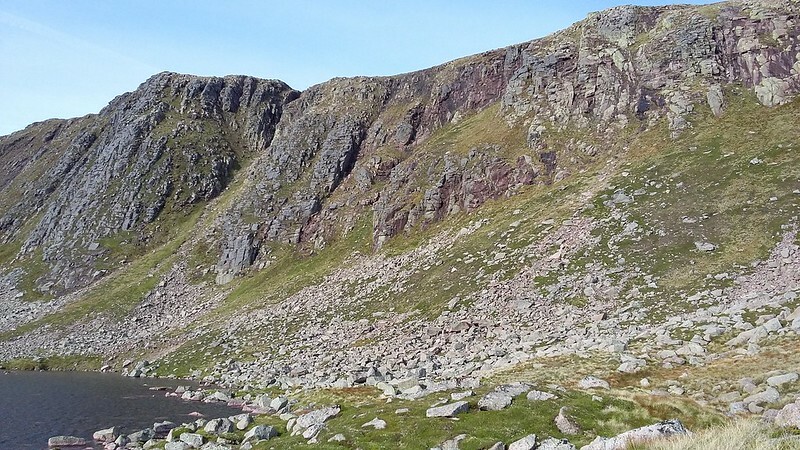 This view is looking across the magnificent cliffs to the South Top, perched dramatically over Dubh Lochan. This was somewhere I really wanted to go, but I could see that I would likely be blundering about in the dark on Beinn Bheag if I tried this, so reluctantly I decided to give it a miss on this occasion, just walking for a few hundred metres along the top of the cliffs to see as much of it as I could. 2016-09-17 17.21.24. 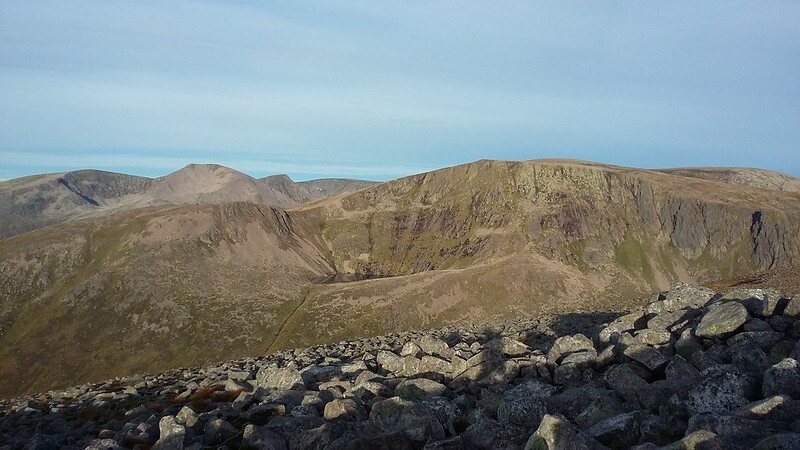 A final look back at Ben Avon, before heading off towards Beinn Bhreac. 2016-09-17 17.34.32. And now I see what a horrible flat boggy plain there is to traverse to get there! It looks like it's going to be difficult enough to get across it in this beautiful fine weather, never mind in clag, as I'd contemplated doing if Derry Cairngorm had been clag-bound and I'd set off anti-clockwise. And so it turns out. 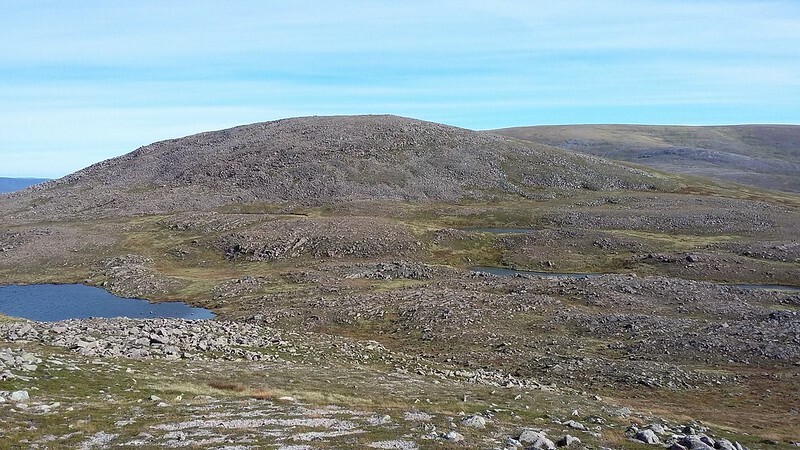 For at least 3 km it's very flat, with bogs, pools and hags, so effective direction finding would be very tricky in clag without GPS since it's really difficult to follow a straight line. Eventually I hit something more like a path, shortly before the ascent to the summit of Beinn Bhreac, but it's intermittent, and anyway, by this time the ground is a little better. I don't know if anyone reading this has ever found a decent path, but I could not recommend the route I took to anyone unless they were of a limiculous disposition!!! 2016-09-17 18.21.50. This is pretty typical of much of the way. In the background are the twin summits of Beinn Bhreac. 2016-09-17 19.00.55. 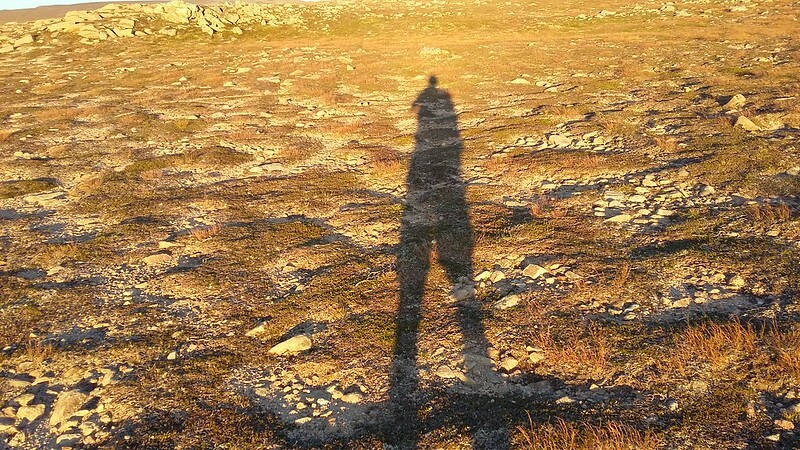 As I approach the main summit from the West, I suddenly emerge from the shadow of the hills, and there's a pleasing symmetry with the shadow selfie from this morning. 2016-09-17 19.05.29. And at last the final summit! Alleluia! This pic looking approximately South East. And it's the last of the day: it's now getting too dark. But the descent is pretty quick, and the main path through the forest, once I hit it, very good, so I'm soon back at Derry Lodge. Double alleluia - still no midgies! 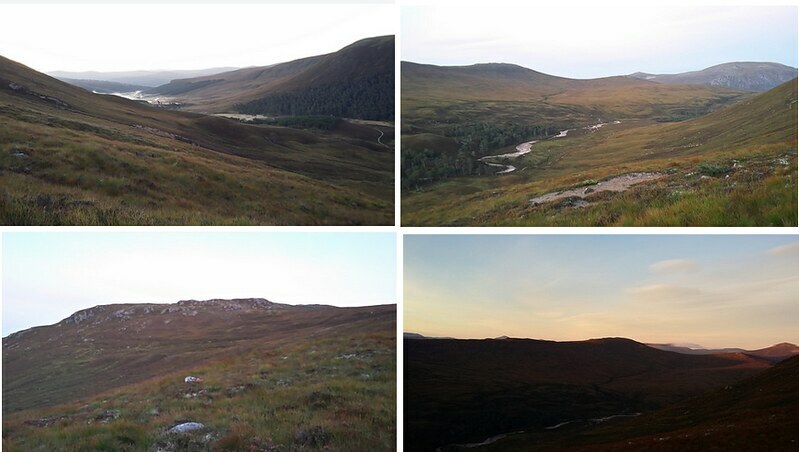 A quick bike ride back to Linn of Dee, arriving back in the car park at just after 20.00. I'm pretty tired by this time, and so decide not to start the 8 hour drive home, but to use the campsite in Braemar, get showered, and have a long sleep. 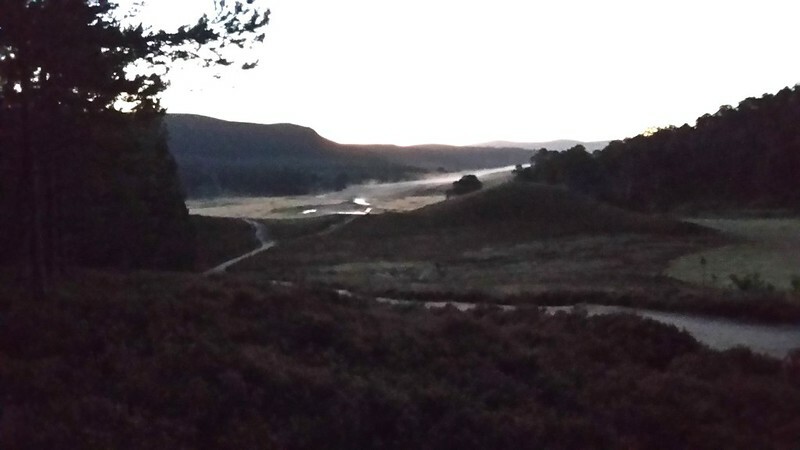 Sadly the campsite is full, so, unshowered and undoubtedly pungent as I am, I pull off on to a minor road just outside Braemar and kip in the back of my car. No midgies, so I'm able to sleep with open windows - no suffocation anxieties! Postscript. Brilliant moonlight through the night until around 04.00am But when I set off at 06.00am it had clouded over. So Saturday proved to be the right choice after all!! Last edited by Alteknacker on Fri Oct 28, 2016 6:33 pm, edited 5 times in total. Totally agree that Loch Etchachan is a magical place. 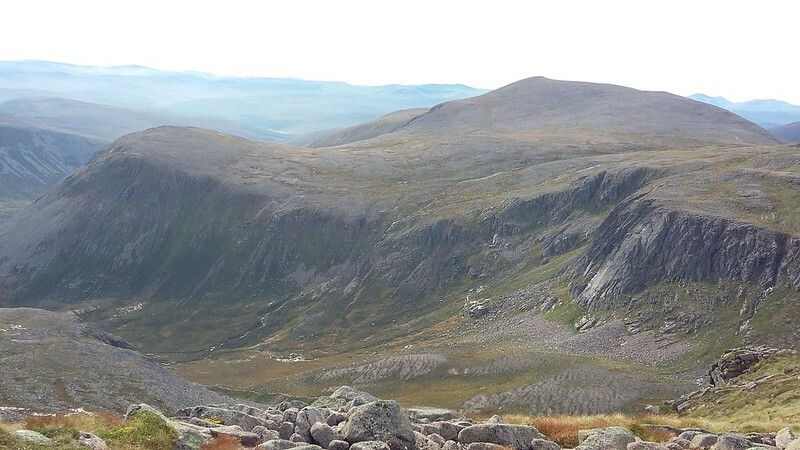 I camped up there back in September 1998 when I did the Cairngorm 4000's. Been there a few times since including in whiteout conditions when it was completely frozen over and covered in a thick blanket of snow! 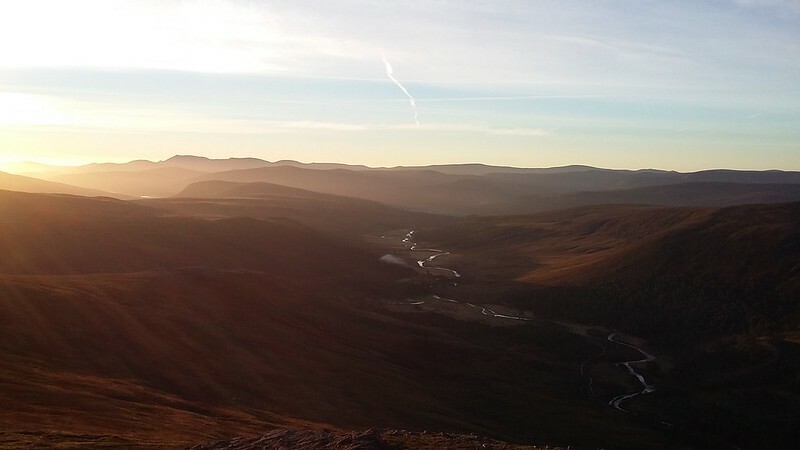 For me it's the quintessential Cairngorms. I know what you mean about the Moine Bhealaidh. Looks innocuous on the map but in reality it's a horribly frustrating place to cross. Definitely recommendable to limicolous (not 'limiculous') creatures only! 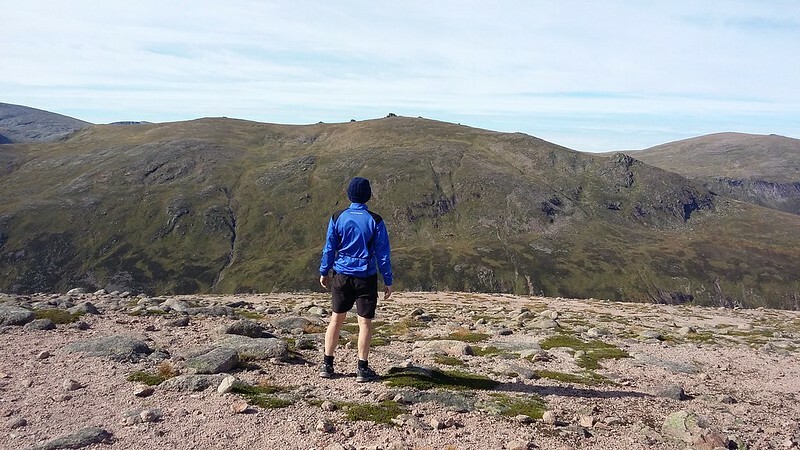 Looks like you're a Cairngorm convert! Thanks dav. I'd absolutely love to get to Etchachan in winter, and probably will if my son keeps to his intent of moving to Stirling. BTW have you climbed any of the cliffs around there, like around the Forked Gulley? They looked brilliant. Ooft that was another cracking long day. Alteknacker wrote: BTW have you climbed any of the cliffs around there, like around the Forked Gulley? They looked brilliant. It looks brilliant! This is in fact part of the cliff I was referring do when I mentioned the Forked Gully, which I assume from the map is the gully just to the left of The Talisman. All that cliff looks great from a distance, so I'm surprised to see that only The Talisman is listed as a classic climb. Thanks RH - yes, one is definitely spoilt for choice. And I've only just discovered it, so plenty yet to look for! 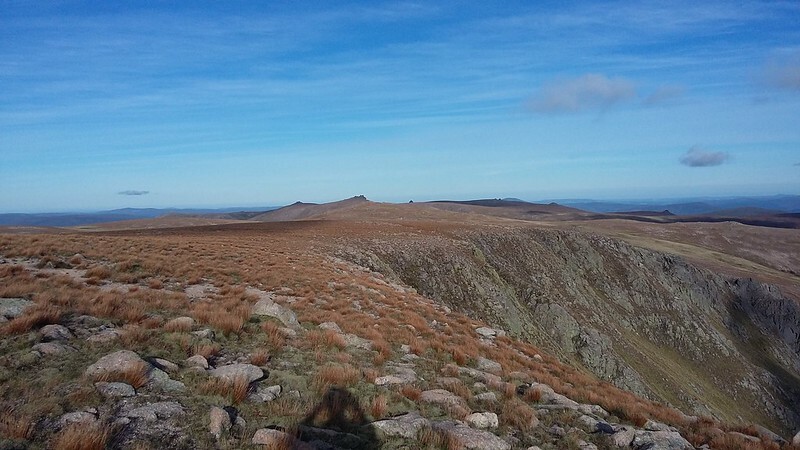 Impressive stuff - glad to see that your previous walk didn't put you off the Cairngorms, as it was the sort of weather that has some people dismissing them as boring. By having a day out like this, you will always remember them in a good light . You certainly covered a lot of ground, and passed many of my favourite places . 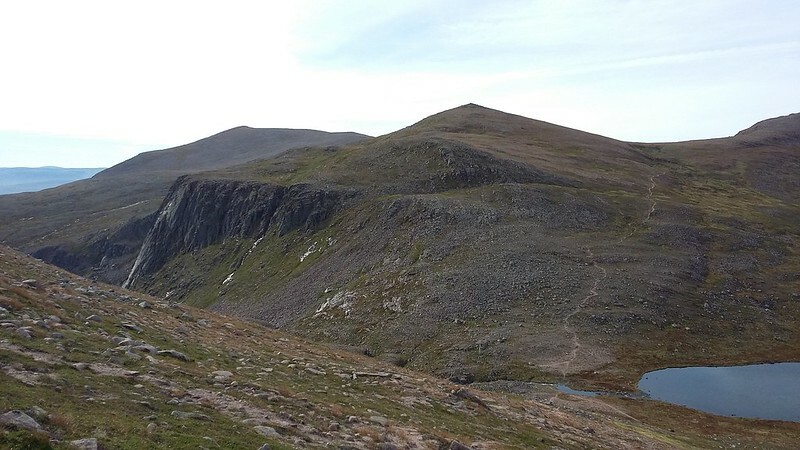 I do need to get out to the eastern end again though - not really spent much time on Ben Avon and Beinn a' Bhuird, and looking forward to exploring some of the corries and tors there in a bit more detail. malky_c wrote: I... 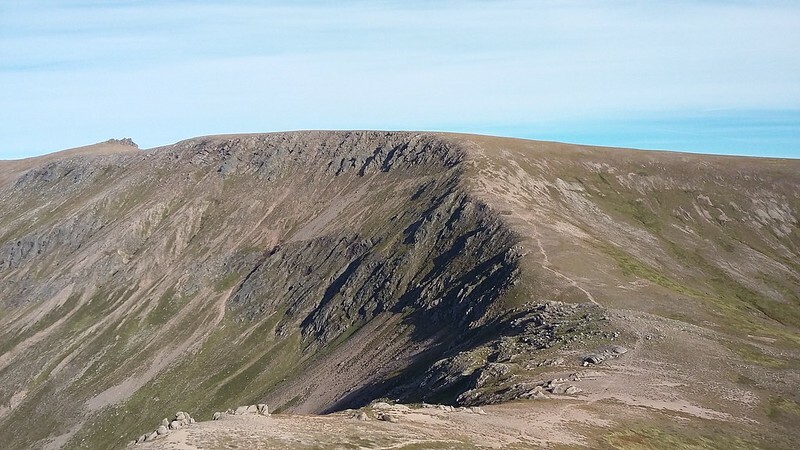 I do need to get out to the eastern end again though - not really spent much time on Ben Avon and Beinn a' Bhuird, and looking forward to exploring some of the corries and tors there in a bit more detail. Beinn a' Bhuird is definitely very impressive, particularly the contrast between the West side - all gentle slopes - and the East side with the fantastic cliffs. I certainly intend to go back and spend a bit more time there. Maybe when I'm retired, and time isn't at such a premium!